The winter is past; the rain is over and gone. Winter is the season of the year when all things lie dormant in a state of typ-ical death. It is a time when trees are stripped of their leaves and fruit is forgotten, when the flowers die, song birds fly away, and even great beasts hibernate in dens of the earth. Winter is a time when men’s lives are sustained only by that which has been stored away, and should it continue long, all things would perish from the earth. Above is an excerpt from the free eBook below “Truth to Open the Understanding” by George Hawtin. We send the document to you via email, please put your full details in the form below. Remember to check your SPAM/Junk folder as the email we send may end up in there. If email is in your SPAM/Junk folder move email back to inbox, so the active download link will work. Please remember to SAVE the document after opening. Apple mobile devices should open/copy the document in iBooks to save. The Digital link we have sent you is active for 72 hours only. Treasures of Truth Volume 22 - 96 Page PDF eBook by George R Hawtin - Widely acknowledged as a “father of the latter rain movement,” along with his brothers Ernest and Phillip, George Hawtin was a popular teacher and expositor, traveling and teaching Bible Truth both near and far. Whereas the “early rain” was acknowledged to be the great and miraculous outpouring of the Holy Spirit on the day of Pentecost, as described so vividly in the second chapter of the Acts of the Apostles, there was another great outpouring and awakening which occurred in the early 1900’s in the United States, with the major centres being Topeka, Kansas and Los Angeles, California. - THIS IS A DIGITAL PRODUCT ONLY. 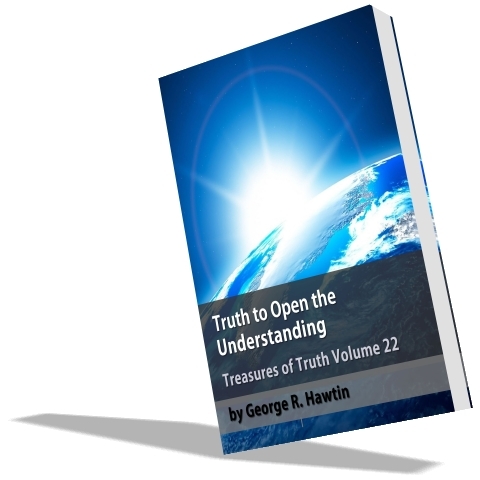 Truth to Open the Understanding by George Hawtin. Thanks Michael for making these great books available. These books by George Hawtin seem especially appropriate for this day and season and help keep one centred on the simple and powerful essentials do the gospel.